What Did Hitler Believe In? The following article regarding the question of what did Hitler believe in is an excerpt from Richard Weikart’s book Hitler’s Religion: The Twisted Beliefs that Drove the Third Reich. It is available to order now at Amazon and Barnes & Noble. There is certainly no evidence he ever sought forgiveness from God, for he was convinced to the end of his life that he was obeying his God. However, in his unreliable memoir, Mein Kampf, Hitler claimed he did kneel in prayer, at least on one occasion. To atheists, they argue that what Hitler believed in was Christianity. When World War I broke out, he wrote, “Overpowered by stormy enthusiasm, I fell down on my knees and thanked Heaven from an overflowing heart for granting me the good fortune of being permitted to live at this time.” After Hitler came to power, he enjoined his fellow Germans in a 1936 speech, “Let us fall down upon our knees and beg the Almighty to grant us the strength to prevail in the struggle for freedom and the future and the honor and the peace of our Volk, so help us God!” Hitler intentionally cultivated an image of piety and righteousness that served him well in his climb to power and in maintaining popularity after achieving power. He wanted people to see him as a kneeling, devout supplicant. 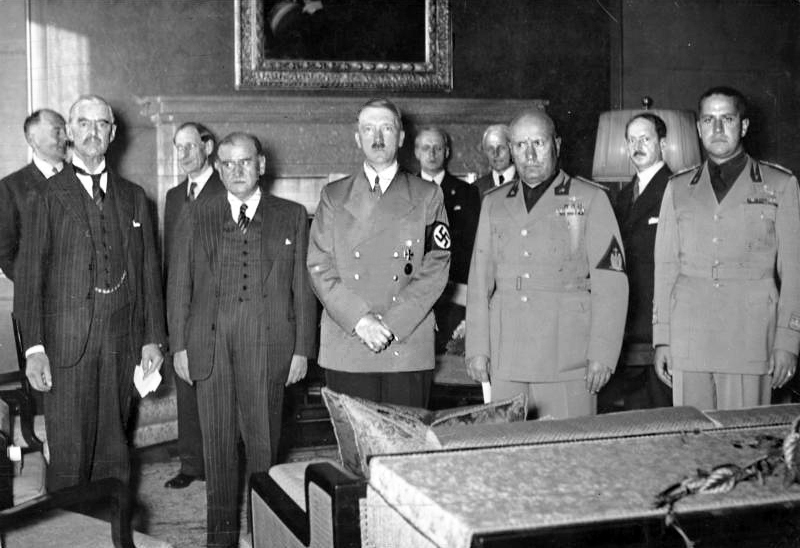 This controversy over Hitler’s religion—as well as the relationship between religion and Nazism in general—has raged since Hitler emerged as a significant political figure in Munich in the early 1920s. Otto Strasser, a leader in the early Nazi movement who broke away from Hitler in 1930, told his brother in the late 1920s why he was increasingly dissatisfied with Hitler: “We are Christians; without Christianity Europe is lost. Hitler is an atheist.” Despite the fact that Hitler never renounced his membership in the Catholic Church, before he seized power in 1933 and for about two months thereafter, the Catholic hierarchy forbade Catholics from joining the Nazi Party because they viewed Hitler’s movement as fundamentally hostile to their faith. In 1937, Pope Pius XI condemned the Nazi regime, not only for persecuting the Catholic Church and harassing its clergy, but also for teaching ideology that conflicted with Catholic doctrines. The White Rose, a student resistance movement at the University of Munich that espoused Catholicism, wrote in a 1942 anti-Nazi pamphlet, “Every word that issues from Hitler’s mouth is a lie. When he says peace he means war and when he most sinfully names the name of the Almighty, he means the force of evil, the fallen angel, Satan.” Hans and Sophie Scholl and other White Rose activists were guillotined after they were caught distributing leaflets denouncing the German atrocities in Eastern Europe and encouraging their fellow Germans to oppose the regime. And yet, Hitler was incredibly popular during the Third Reich, almost to the very end. Most Germans who voted for Hitler or joined his party considered themselves good Christians, and many of them hailed Hitler as a protector of Christianity from the godless communists. Some Protestant pastors and Catholic priests joined the Nazi Party and cheered Hitler on, and some internationally respected Protestant theologians climbed aboard the Nazi juggernaut, too. 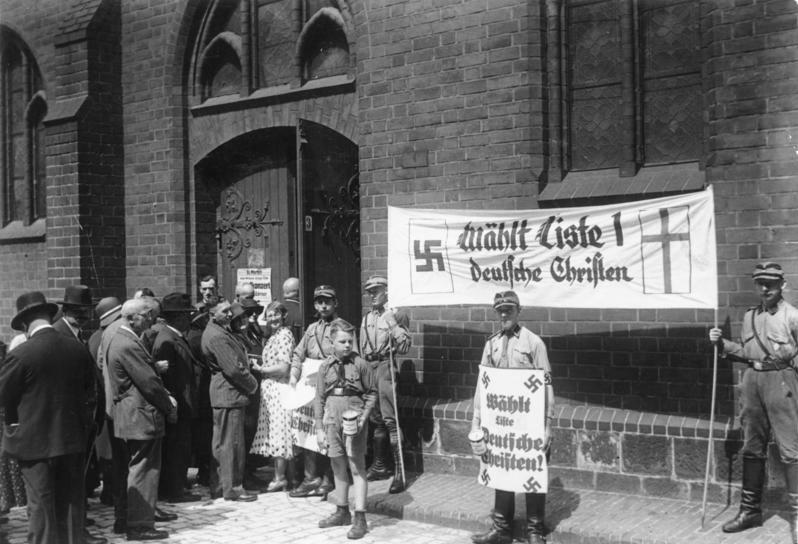 By the mid-1930s, about 600,000 German Protestants had joined the German Christian movement, which synthesized Nazi ideology and liberal Protestant theology. In 1933, Hitler publicly promoted the German Christian candidates in the Protestant Church elections, giving encouragement to those who hoped for an amalgamation of Christianity and Nazism. Some argue that what Hitler believed in were more nefarious beliefs. The conflicting views of Hitler as atheist or Hitler as devout Christian are further complicated by the widespread view of Hitler as a disciple of the occult. 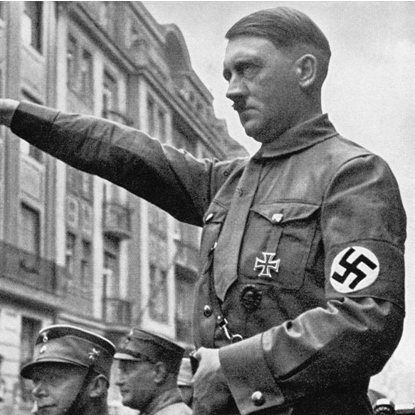 Hitler’s evil was so intense and inexplicable that some suspect he must have had supernatural connections with the underworld that enabled him to sway the masses and rise to power in Germany. Myriads of books and films purport to prove Hitler was a follower of the black arts. So what did Hitler believe in? Was he an atheist, a Christian, or an occultist? He was none of these three. He was not an atheist, because he sincerely believed in the existence of God. He was not a Christian, because the God he believed in was not Jesus Christ or the God of the Christian Bible. He was not an occultist, because he overtly rejected occult beliefs and mystical practices. What Hitler believed in was pantheism—or, if not pantheism, at least close to it. He believed that nature, or the entire cosmos, is God. At first glance, it might seem that Hitler’s pantheistic worship of nature is incidental, a bit of trivia that does little or nothing to help us understand the man and the atrocities that he committed. But to suppose this would be a mistake. Hitler’s devotion to nature as a divine being had a grim corollary: the laws of nature became his infallible guide to morality. Whatever conformed to the laws of nature was morally good, and whatever contravened nature and its ways was evil. When Hitler explained how he hoped to harmonize human society with the scientific laws of nature, he emphasized principles derived from Darwinian theory, especially the racist forms of Darwinism prominent among Darwin’s German disciples. These laws included human biological inequality (especially racial inequality), the human struggle for existence, and natural selection. In the Darwinian struggle for existence, multitudes perish, and only a few of the fittest individuals survive and reproduce. If this is nature’s way, Hitler thought, then he should emulate nature by destroying those destined for death. Thus, in his twisted vision of religion, Hitler believed he was serving his God by annihilating the allegedly inferior humans and promoting the welfare and prolific reproduction of the supposedly superior Aryans. Another debate that has exercised historians is whether the Nazi regime itself should be characterized as a “political religion.” Most of those interpreting Nazism as such construe it as a secular substitute for the dominant religion in early twentieth-century Germany (i.e., Christianity). There are some historians who interpret Nazism as a purely political movement and thus question the analytical helpfulness of the idea of political religion. On the other extreme, historians insist that Nazism was not merely quasi-religious or pseudo-religious, but a full-blown religion. Since the debate influences perceptions of what did Hitler believe in, I will address it briefly in this introduction. According to the official Nazi report, this “confession of faith” was greeted with a roar of approval. From the Nazi perspective, the beauty of this minimalist confession of faith in the outdoor cathedral was that it could potentially appeal to anyone who believed in any kind of God, whether Christian or anti-Christian, theist, deist, or pantheist. Indeed, the Nuremberg Party Rally continued through the weekend, and when it came time for the normal Sunday morning worship services for the Christian God, Hitler and the Nazi hierarchy conspicuously participated in Nazi Party festivities instead of going to church. Instead of celebrating the Lord’s Day, Sunday at the Nuremberg Party Rally was SA Day, a time to honor the SA, or Nazi stormtroopers. 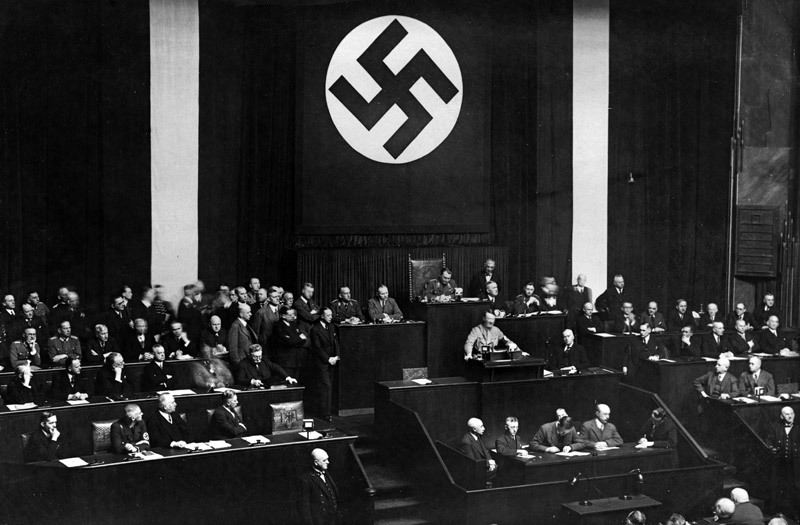 In his speech immediately after Ley’s “confession of faith,” Hitler gave this faith a slightly different twist, exhorting the party leaders to put their faith in the German Volk. He first rehearsed the way that Germany had risen up from its position of weakness and degradation since he had come to power four years earlier. This “miracle of renewal in our people (Volk),” Hitler suggested, came about not as a “gift from heaven for unworthy people” but because they had fanatically sacrificed for the “resurrection of a Volk.” “It is the faith in our Volk that has made us small people (Menschen) great,” Hitler pronounced. The future, he believed, was auspicious because the German Volk was “born again.” The speech was saturated with religious terminology, most of it directed not toward God, but toward the German Volk. Nonetheless, Hitler closed his speech by promising the young people in Germany that if they would do their duty, “then God the Lord will never forsake our Volk.” This 1936 speech was not unusual, as Hitler often invoked religious themes to arouse consecration to the German Fatherland while simultaneously appealing to God as the providential creator and sustainer of the German Volk. One Volk—one Empire—one Führer! How often in the last decade and above all in the last years has this call of all Germans resounded upward again and again. This battle cry of all Germans is jubilation and joy for some, confession and faith for others, and pride and power for the entire German nation. Young and old, rich and poor, without distinction all Germans repeat it again and again, and so we also want to let this confession of Germans ring out in this solemn hour in the cathedral of light: One Empire—One Volk—One Führer! In this new slogan, which was widely disseminated in the Third Reich on posters and a postage stamp, the Führer had replaced God. Just two years earlier, Ley had led the gathered Nazi Party officials in confessing faith in a God who had sent the Führer. By 1938, the confession of faith did not even mention God and seemed to imply that Hitler was now filling His shoes. We need no Christian virtue For our Führer Adolf Hitler Is ever our Mediator. No pastor, no evil one, can hinder Us from feeling as Hitler’s children. We follow not Christ but Horst Wessel, Away with incense and holy water. Baldur von Schirach [leader of the Hitler Youth], take me along! Not only was this a clear expression of a desire to replace Christianity with Nazism, but it also exalted Hitler to a position that the Christian churches gave Jesus, who is often called the Mediator in the Bible and Christian theology. In the end, if all one means by “political religion” is the political appropriation of religious symbols, terminology, rites, ceremonies, and emotions, then clearly the Nazis excelled at this. However, is this enough for Nazism to qualify as a religion, a political religion, or a secular religion, all terms used at times to describe Nazism? Moreover, what did Hitler believe in regarding Nazism as a religion? This is easier to decipher, since he explicitly answered this question more than once. In Mein Kampf, he explicitly rejected the idea that he should become a religious reformer, insisting that Nazism was a political, not a religious movement. In fact, throughout his career, Hitler urged neutrality on purely religious questions, and he tolerated a variety of views about religion within the Nazi Party. Some leading Nazis considered themselves Christians, while others were staunchly and forthrightly anti-Christian. Some Nazis embraced occultism, while others scoffed at it. Some promoted neo-paganism, while others considered pagan rites and ceremonies absurd. Hitler really did not care what they believed about the spiritual realm as long as it did not conflict with Nazi political and racial ideology. In October 1941, in the midst of a diatribe against the Christian churches, Hitler admitted that Nazism could never be a complete substitute for religion because it did not offer anyone a coherent position on metaphysics. Thus he counseled toleration for those who had a heartfelt desire for religion. He remarked that someone feeling a need for metaphysics cannot simply be handed the Party Program. The folkish worldview [i.e., Hitler’s own position] finds the importance of mankind in its basic racial elements. In the state it sees in principle only a means to an end and construes its end as the preservation of the racial existence of man. Thus, it by no means believes in an equality of the races, but along with their difference it recognizes their higher or lesser value and feels itself obligated, through this knowledge, to promote the victory of the better and stronger, and demand the subordination of the inferior and weaker in accordance with the eternal will that dominates this universe. Thus, in principle, it serves the basic aristocratic idea of Nature and believes in the validity of this law down to the last individual. It sees not only the different value of the races, but also the different value of individuals. . . . But it cannot grant the right to existence even to an ethical idea if this idea represents a danger for the racial life of the bearers of a higher ethics. In this passage, Hitler hinted at his pantheism by equating the “eternal will that dominates the universe” with the “aristocratic idea of Nature.” However, he clearly enunciated the central tenet of his worldview: the primacy of race. This racial worldview attempted to explain the essence of human existence and the meaning of history, while also providing moral guidance. Therefore, what did Hitler believe in regarding pantheism? Though this does not make Hitler’s ideology a religion per se, his comprehensive philosophy of life inevitably came into conflict with many religions, because most religions also claim to provide answers to these fundamental questions. Hitler recognized this problem, maintaining in Mein Kampf that a worldview such as his own must be intolerant toward any other worldview that conflicts with it—and here he specifically mentioned Christianity as a rival. He knew that converting Germans to his worldview of what Hitler believed in would not leave the religious landscape unchanged. In an August 1933 speech, Hitler stated, “The unity of the Germans must be guaranteed by a new worldview, since Christianity in its present form is no longer equal to the demands being placed on the bearers of national unity.” Three years later, in his cultural speech to the Nuremberg Party Rally, he told the party faithful, “A Christian era can only possess a Christian art, a National Socialist era only a National Socialist art.” Hitler believed that the triumph of his worldview would transform the entire culture of Germany, whereupon it would no longer reflect previous religious concerns. 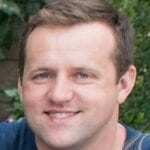 What did Hitler believe in regarding secularism? Did Hitler’s desire to supplant Christian culture with Nazi culture mean he was intent on secularizing German society? This is hotly debated. Already in 1947, the German theologian Walter Künneth argued that Nazism was the result of religious decay and secularization. The roots of Nazi ideology, he thought, were found in Darwin, Nietzsche, Houston Stewart Chamberlain, and Oswald Spengler, whose ideas he considered products of secularization. Many scholars today agree with Künneth that Nazism is a manifestation of secularization. Detlev Peukert, for instance, argued in his seminal essay, “The Genesis of the ‘Final Solution’ from the Spirit of Science,” for the importance of a secularized version of science in shaping Nazi ideology. Claudia Koonz explicitly calls Nazis “modern secularists” and interprets the Nazi conscience as a “secular ethos.” Richard Steigmann-Gall, meanwhile, strenuously objects to this interpretation, arguing instead that “Nazism was not the result of a ‘Death of God’ in secularized society, but rather a radicalized and singularly horrific attempt to preserve God against secularized society.” And Todd Weir, while admitting that the Nazi stance toward secularism was ambiguous and even paradoxical, nevertheless argues that the Nazi’s espousal of “positive Christianity” made them opponents of secularism. Scholars and especially popular works on Hitler, in fact, have identified him with just about every major expression of religion present in early twentieth-century Germany: Catholic Christianity, non-Catholic Christianity, non-Christian monotheism, deism, pantheism, occultism, agnosticism, and atheism. One reason for this confusion is that Hitler consciously obfuscated his position whenever he thought he could gain political capital needed to secure power or retain popularity. While many of his long-term goals were fixed, he was flexible about short-term policies, and he was not averse to concealing his goals if he knew they would not be popular. Another problem creating confusion about what Hitler believed in is that some people (though usually not historians, who know better) think the Nazis had a coherent religious position. Some wrongly assume that because Rosenberg or Himmler embraced neo-paganism, this must have been the official Nazi position. However, there was no official Nazi position on religion, except perhaps for the rather vague and minimalist position that some kind of God existed. 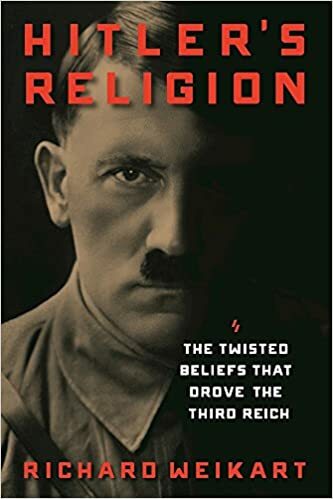 This article is an excerpt from Richard Weikart’s book Hitler’s Religion: The Twisted Beliefs that Drove the Third Reich. It is available to order now at Amazon and Barnes & Noble.